Junior Kylie Long, the quiet and composed leader of the Wake Forest women’s volleyball team, is having a career year for the Demon Deacons. Recently named ACC Co-player of the Week for the week of Sept. 26, Long has started all 18 matches for the Deacons and has played in every set. 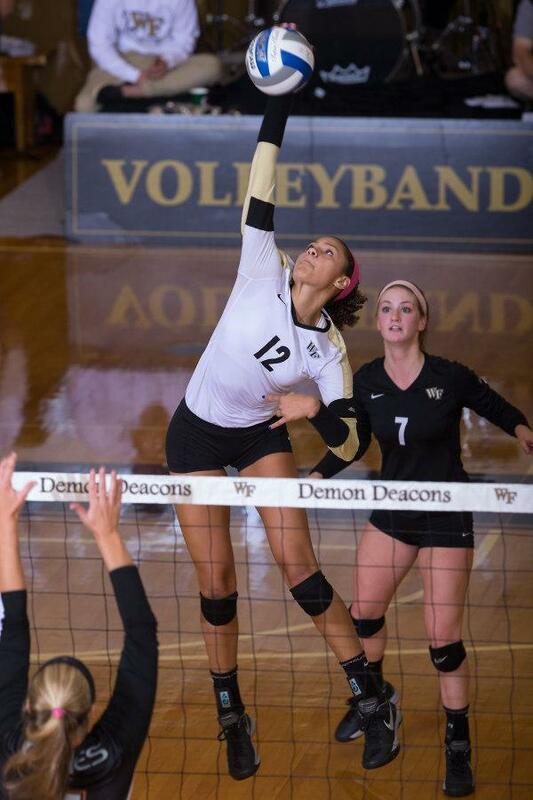 A six-foot-two outside hitter, Long is leading or at the top of nearly every statistical category for the Deacons. Long leads the team in kills, is third on the team in digs and leads in receptions. After being named to the All-ACC Freshmen team her first season at Wake Forest, Long is hungry to have her best season yet, and she’s making the most of her junior year so far. The women’s volleyball team sits at 7-11 entering the middle of their season, but with an all-new coaching staff, morale is high both on and off the court. The Deacons will look to secure their fourth ACC win against Virginia this Friday, Oct. 14 at Wake Forest. With the coaching change this season, how well do you think the transition has gone? I think it’s gone extremely well. The culture has changed in our gym, and it’s a lot more positive and welcoming. The change has been great for building us as players and as people so it’s been great. How has the team responded to the coaching change on and off the court? I think we’ve all embraced and trusted the process. We know that the immediate result might not be exactly what we want, but if we just keep going, going and going with it, it will all work out eventually. As a junior, do you feel like you’ve taken on a mentoring role for some of the younger players on the team? I think with some of our louder players, like Caroline, my role is more of being the calm person and reminding everyone that it’s all good, and we’re fine. Even if the other team scores a good point or whatever, we’re still good, and we can still do what we need to do. Do you think your role on the court and in the locker room has changed from your freshman year to now? I think as I’ve gotten older, I’ve become more confident in that role. Freshman year I was just sort of quiet and doing the right thing, and now, I’m still quiet and doing the right thing, but I can bring other people in with me. Do you feel like you’ve had a role model at Wake Forest, either on the volleyball team or somewhere else on campus? He’s not on the team, but he’s in Student-Athlete Services, and his name is Dwight. He’s been with me since my first summer here, encouraging me and reminding me when I’m not so positive about myself that I can do it. How have you evolved as a player on the court since you’ve arrived at Wake Forest? I think I’ve become just more intelligent as I play. For me, especially since it’s my third go-round in the ACC, I know a little bit about what the other team’s going to be like and what is going to be successful. Congratulations on ACC Co-Player of the Week. What does it mean to recieve accolades like this? It’s always great to be acknowledged for your hard work, but I also know that I couldn’t get it without my team, and I needed their help and their support. We have to win to get stuff like that also, so it’s always great to get the win. Coming off of a good win against Pittsburgh and a strong performance against Duke, what does the team need to do in order to maintain that high level of play? Against any opponent in general, we just need to limit the runs. We’re pretty good early on, and we come out and jump on people. We’re good hanging one ball to another, but as soon as they start getting on runs, people start freaking out. It’s just about staying calm and knowing that they may get two or three points here, but we’ll come back with four. Is there a difference in preparation for matches against ACC teams and against non-conference opponents? Preparation is pretty much the same in conference and out of conference, and we do the same kinds of film sessions for both teams. I would say that competition-wise, sometimes the other teams are gunning for us more if they’re not in the ACC, whereas ACC teams know that they’re here for a reason. What are the team goals for this season, and do you have any personal goals for this season? Definitely to earn respect in the ACC — that’s our main goal. For me personally, I’d like to make the All-ACC team, because I didn’t last year, and I did freshman year.